Last season the Houston Astros won the World Series, and majority of the hype around the team was their ridiculous offense. Their lineup is filled with guys who hit for a high average, draw walks, steal bases, and hit home runs, all while not striking out much. 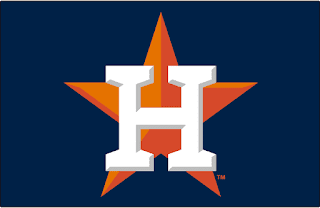 Houston led the MLB in batting average, OBP, slugging, hits, runs, total bases, doubles and the least amount of strikeouts. Only the Yankees had more home runs. Houston is not suffering from a World Series hangover in 2018, as they lead the AL West and currently sit 14 games over .500 at 32-18. However, the offense is not the biggest reason for their early season success. It's their dominant pitching. The Astros pitching staff is doing what their offense did last season, leading the majors in just about every stat. Their team ERA is 2.42, almost a run better than the Arizona Diamondbacks who are second best with a 3.31 ERA. In 49 games, Astros starting pitchers have put together 36 quality starts. Milwaukee who has 31, is the only other team with more than 29 quality starts. Toronto has just 14. Houston is the first team to reach 500 strikeouts on the season, with Boston behind them with 481. Kansas City pitchers have struck out just 332 batters. 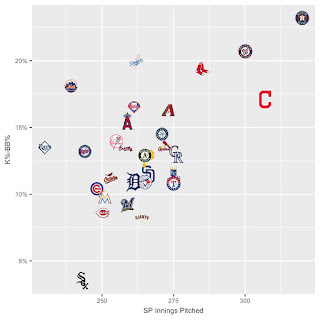 Opposing batters are hitting UNDER .200 against Astros pitchers. .196 to be exact. Washington ranks second with a .218 BAA. 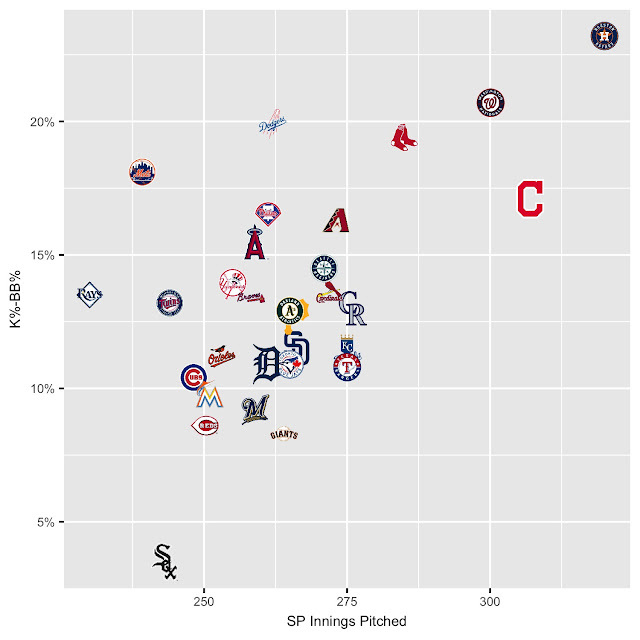 Baltimore pitchers are the worst, allowing batters to hit .284 off of them. The Astros have given up the fewest hits, just 307. Baltimore has allowed 483. Houston has allowed just 505 total bases, which is best in the majors. The Cubs are second allowing 541. Texas ranks dead last giving up 816 total bases. Tied with the Cardinals, the Astros have given up 39 HRs, the least in the majors. Texas, Kansas City and Cincinnati have allowed 70+ home runs. Now let's take a look at how they put together their amazing pitching staff. The Astros acquired Verlander last season to help during their World Series run. Houston gave up minor leaguers Daz Cameron, Jake Rogers and Franklin Perez. Safe to say the Astros got more than they imagined acquiring Verlander as he's dominating every lineup he faces. After winning the World Series, the Astros went out and traded for struggling Gerrit Cole to help build a stronger rotation for 2018. Houston traded Joe Musgrove, Colin Moran, Michael Feliz and Jason Martin to acquire him. Cole who was the number 1 pick back in 2011 won 19 games in 2015 but went 19-22 the next two seasons. Maybe a change of scenery was all he needed. Keuchel has been with the Astros since 2009, when they drafted him in the 7th round. He won the Cy Young award in 2015, when he won 20 games, but went just 9-12 in 2016 with a 4.55 ERA. He bounced back last year with a 14-5 record and a sub 3 ERA, leading this staff to the World Series. McCullers Jr. was the Astros 1st round pick (41st overall) back in 2012. He's the baby of the rotation at just 24 years of age, but will eventually be the ace of this staff. He's got a bulldog mentality and it showed throughout the entire 2018 postseason. He's never won more than 7 games in a season but he'll likely more than double that this year. After pitching for 9 seasons in the majors with limited success, only winning 10 games once in his career and a high of 126 strikeouts, the Astros took a flier on Morton before the 2017 season as a free agent. Morton flourished in his first season with the Astros, going 14-7, striking out 163 batters in 143.2 innings. He changed his style coming to Houston, from being a guy who threw 91-93 MPH to now consistently hitting 98 on the radar gun and occasionally 100, and this is with a sinker!